Agajan has a message for Afghanistan’s incumbent politicians. The turbaned, gap-toothed man may only be a humble shop-keeper, but on election day, Agajan will exercise his right and vote against the president. “I won’t vote for Hamid Karzai,” says Agajan, who according to local custom uses only one name. “He did not pave the road, he promised to rebuild Bamiyan, but he didn’t deliver.” Agajan points from his shop — a low, mud-brick building with hand-carved wooden shutters where he sells beans, rice and cookies — at the rutted dirt road outside his doorway, and at the freshly-painted medical clinic across the street. Looks can be deceiving. Agajan says the clinic has no doctors and no medicine. His shop window is plastered with posters of several of the more then 90 candidates also running for Bamiyan’s provincial council. But Agajan has conspicuously left one provincial council candidate’s poster lying down on the windowsill. “The incumbent,” Agajan explains with a hearty laugh. “He didn’t do anything for us.” According to the Afghan Independent Election Commission, more then 200,000 voters are registered to cast their ballots Thursday in this picturesque, relatively peaceful province in central Afghanistan. On the eve of the election, cargo trucks escorted by Afghan police in pick-up trucks, bounced up bone-jarring mountain roads to deliver blue plastic ballot box kits to schools and mosques which will serve as polling centers Thursday. In addition to ballot papers and voting ink, the kits are equipped with flashlights and batteries since so many polling stations across the country do not have electricity. Unlike southern, eastern and increasingly northern Afghanistan, Bamiyan is a virtual oasis of peace, spared the daily drumbeat suicide attacks and roadside bombs. 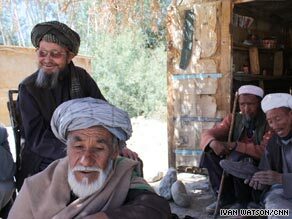 The ethnic Hazaras, who make up the much of the population here, suffered terribly at the hands of the Taliban until the movement’s overthrow in 2001. The Taliban were fundamentalist sunni Muslims, who viewed Hazaras from the shiite sect of Islam as infidels. The militants also attracted international and local condemnation when they demolished Bamiyan’s two ancient 100-foot tall Buddha statues. And yet, despite the fact that this has been one of the peaceful provinces in the country, eight years after the Taliban’s overthrow, many locals complain that Bamiyan has been overlooked when it comes to reconstruction and development. For example, there are still fewer then five miles of paved road in Bamiyan. Despite accusations of neglect, many residents here say they will vote to re-elect Karzai. In the run-up to the vote, Karzai won the endorsement of two former Hazara militia commanders, Abdul Karim Khalili and Mohammed Mohaqeq, who fought against rival ethnic militias during the bloody civil war of the 1990s. During a rally in Bamiyan earlier this month, Khalili told supporters “a vote for Karzai is a vote for me,” says one Western official who works in the area. Jumaqul Mohamdjan, an 18-year old high school student, says he will vote for Karzai even though he says, “Karzai did nothing for Bamiyan. But Khalili,” he added “did everything for Bamiyan.” As part of his re-election bid, Karzai has recruited other former warlords with dubious human rights records to his election campaign, including Tajik leader Mohammed Fahim as a vice-presidential running mate and former Uzbek militia commander Rashid Dostum. Dostum returned from exile in Turkey to campaign for Karzai this week, after fleeing the country following clashes with a rival in Kabul. Dostum’s return was criticized openly by the U.S. Embassy in Kabul. There has already been criticism among human rights activists and some diplomats, of what some have called Karzai’s campaign platform of warlords. “I’m still happy and hopeful that there seem to be elections,” said Amnesty International’s Sam Zarifi, in an interview earlier this month. “But Karzai’s not even running on a platform of promises or performance, but just an old fashioned Afghan cutting of deals, which is a shame.” “This campaign will cost Karzai enormously,” says one Western diplomat stationed in Afghanistan, who spoke on condition of anonymity. The diplomat said if Karzai wins this election, “Karzai’s victory will come at a drastically higher political price then the 2004 elections.” Shoe cobbler Kaka Muchi says he’s voting for Karzai’s record of stability in Bamiyan. “Business is not bad,” he said, as he pulled a needle and thread through the sole of an old sneaker, “as long as there is security.” But even this mile-high pocket of tranquility has seen its calm come under threat in recent months. Afghan and international election workers in Bamiyan say they have received reports in recent weeks of armed men going house to house warning people not to vote. And commanders of the small contingent of soldiers from New Zealand based in Bamiyan tell CNN they saw a spike in insurgent attacks over the last four months. Will Pakistan’s Shari’a Pact Calm or Inflame a Troubled Region?